OG WAS the first to see the three men of the Flat Head tribe toiling up the river trail. He and Ru and Tao were sitting together in the sun beside the council rock at the foot of the cliffs where the Cave People dwelled, feeling very comfortable with the sun beating against their backs, when Og's always watchful eyes picked out the moving objects down the slope. A half grunt of surprise and half of warning escaped him, as he raised his hairy arm and big hand and pointed. "Look. Flat Heads come. They come in peace and bring presents, salt maybe," he said, as his dark eyes watched the men turn from the trail and bending low under sack-like burdens, plod up the slope toward the council grounds. Tao stopped work on the piece of flint he held in his hand and looked up, while Ru with a grunt of surprise instinctively reached for his big stone hammer that was never very far beyond his reach. But others beside the three young men at the council rock saw the strangers coming, and presently heads began to pop out of cave doorways to stare curiously for a moment before the occupants, deciding it was safe, ventured into the open and moved toward the council rock. Og and Ru and the smaller and more slender Tao were on their feet watching the three figures approaching, as the Cave People, the elders first with the younger men and women and the children following, began to gather around them. "Who are these people?" queried Ab, the elder whose beard and hair were whitest and who was the leader of the council. "They are Flat Heads from beyond the southern mountains. They come in peace and bring presents. They are Big Tooth, Crooked Foot, and Long Thumbs. I know them," replied Og. "This is strange. Always we have to go to them for salt and bring mussels in exchange. They have never come to our village before," said Ab, deeply puzzled. "Something troubles them, perhaps," suggested Ru. "That is a good guess. I can see by the look on Big Tooth's face he worries. He is the son of the Flat Head chief," added Tao. The three strangers, each bending under a bulging jackal skin rudely formed in the shape of a sack, had toiled up the slope and reached the edge of the council grounds by this time. There they stopped, Big Tooth in the lead, and the other two crowded behind him. They were all three short, stocky men with amazingly long arms and short legs. Their hands were big and powerful and their feet were large with long, almost prehensile, toes. 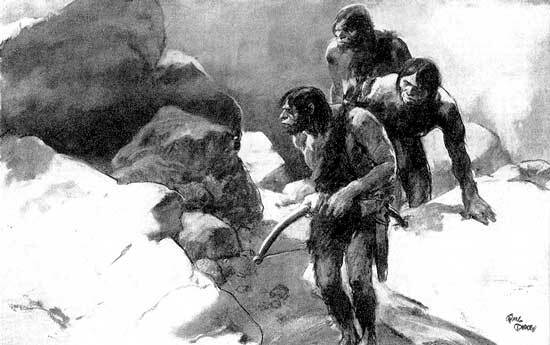 Their shoulders were broad and sloping, their skin was dark, and they were covered with thin, short brown hair; not the thick, coarse, curly hair of the Cave People. They were members of an unprogressive tribe of tree dwellers from the south land who did not even know the use of fire. For a moment as they stood there on the edge of the council grounds, confronted by the whole colony of Cave People, they looked about with uncertainty and embarrassment and not a little fear at their own boldness. But as Big Tooth's eyes picked out Og and Ru and Tao in the group, his uneasiness vanished and a strange smile wrinkled his broad face. "Ah-dook!" he exclaimed. "Our eyes are glad to behold the Big and Little Bowman, and Tao the Thinker. We have traveled many suns to find their village. We are happy that our search is ended. We have brought three skins of medicine sand as a token of our friendship, and we have come to ask a favor of the people who kill with bows and arrows." As Big Tooth spoke, he put down his burden and advanced two steps, where he paused and raised his long arms aloft with palms turned outward in a token of greeting and friendship. And when this peace sign was read by Og and the elders and the rest of the Cave People, it was returned with enthusiasm, and suddenly a great babble of excitement broke out, as men, women, and children began talking and laughing and crowding forward, while the Flat Heads opened their jackal skin sacks on the ground and displayed three heaps of coarse salt crystals. Indeed, the elders had a difficult time for a little while keeping the excited Cave People from breaking into a mad scramble to get some of that precious salt, which they called medicine sand, and which they liked so much and had so little of. By dint of many shouted commands, however, and some well-aimed cuffs for the children, the crowd was driven back, and presently a council ring was formed beside the great rock where a big fire was kindled, while the women went back to their caves and brought out whatever meat they could find to start a feast that would last far into the night, to celebrate the arrival of the strangers and the acquisition of a new supply of salt for the cave colony. BIG TOOTH and his companions were given a place in the council ring to the right of Ab the elder. Og and Ru and Tao were seated close at hand, and, while the feast was in preparation, the council was solemnly opened by Ab in a speech of welcome and an invitation to Big Tooth to explain his mission. The Flat Head leader found this a trifle difficult at first, for, like his people, he was not a fluent speaker, nor was his language quite the same as that of the Cave People, but with Og acting as interpreter, he managed to give his message to the Cave People. Big Tooth's father, Split Ear, the chief and leader of the Flat Heads, had died, he explained, and there was a great quarrel among his people as to who should be leader. Big Tooth thought that the oldest and wisest man should be chosen. Others thought that the strongest and most savage fighter should be the one to command them, and still others thought they should listen to the words of Pong, the devil doctor. There was a great turmoil among them. The colony was breaking up and many of the Flat Heads were reverting to savage customs and old fears and superstitions. While he had lived, Split Ear had sought to wean the Flat Heads away from these superstitions. He had tried to give them courage and faith in themselves. He had tried to make them progressive; to make them come down out of the trees and live on the ground; to learn the use of fire; to make weapons; to hunt and to put away their fears of the things they did not understand. HE HAD made some progress, but his death many moons ago now had made the Flat Heads lose courage. No good leader had come forward to guide them as his father had, but a bad leader, one who called himself Pong, the devil doctor, had gradually swayed the people through fear and superstitious dread. He was fast getting control of the tribe and doing the people great harm. He was invoking old laws that Split Ear had stamped out. One of them was the law of the old men and old women. Pong said that when men and women grew too old to hunt food for themselves and were a burden on the tribe, they must be sacrificed to the Monsters of the Mist, dreaded beings who lived in a shadowy valley that was always draped in steam. Pong said these Monsters of the Mist ruled everything  the sun, the moon, the stars, and the lives of the Flat Heads. When the monsters were angry, they wreaked their wrath on the people, and they could only be satisfied by the sacrifice of the old and useless members of the tribe. "This, my father, Split Ear, said was wrong," said Big Tooth, gathering courage as he talked. "He said that old heads were needed more than strong bodies, to think wise thoughts and keep the tribe together. The Cave People protect and respect their elders and listen to their words of wisdom. But Pong does not want the old people around. 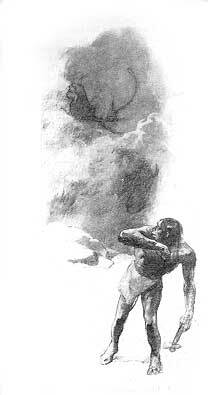 He says they are a burden on the tribe, and he has them sent up to the Valley of the Mist where the monsters dwell. But no one has seen these monsters, and my father, Split Ear, said there were no such beings. Still all the Flat Heads are afraid to go into that dreaded valley. What we need is a mighty hunter to go into the mists and seek out these monsters if there are any and slay them. So, I, Big Tooth, with my companions, Crooked Foot and Long Thumbs, have come to the Cave People to ask them to send Og and Ru and Tao the Thinker to slay these monsters with their bows and long arrows, as they slew the great lizard who lived in the salt cave." When Big Tooth finished speaking and squatted down on his haunches, the council was very quiet for a few moments. The men looked toward old Ab and the other gray beards who sat around him at the head of the council ring, for it was a law of the tribe that no hunters could depart on such a mission without the consent of the elders. For some time Ab was silent, too, his brow wrinkled. Then he glanced toward Og and Ru and Tao, and noting their eager interest, smiled and nodded. "Big Tooth's people are in trouble," he said finally. "The Cave People would gladly help them because we are friends. We get our salt from them. Og and Ru and Tao have already been among the Flat Heads. They shall go again to help them. Three suns hence they will depart, and until then Big Tooth and his companions shall dwell here in our caves with us to rest up from their long journey, while Og and Ru and Tao make ready. Ah-tau," he concluded, "I have spoken." OG AND RU and the younger Tao heard the decision of Ab the elder with feelings of deep satisfaction, though they did not express their emotions save by nodding their heads. They had been among the Flat Heads before. They had found this strange tribe far to the southward when they were searching for salt for the Cave People. They had killed a monitor lizard that had inhabited the salt cave, and this had been a friendly act that had caused the Flat Heads to rejoice and to respect them, and they had laid the foundation there and then for the first bartering to take place between primitive people. The Flat Heads had this salt cave and the Cave People possessed great quantities of mussels which they dug from the mud of their river. The Flat Heads liked the mussels, which did not grow in their shallow streams, and the Cave People needed salt, or medicine sand as they called it. So now and again the men of the cave colony would gather great loads of mussels, wrap them in bear skin bundles and carry them the long distance over the mountains to the Flat Heads, where they would get loads of salt in return. But it was always the Cave People who did the bartering. The Flat Heads were not progressive enough to do that. Indeed, the appearance of Big Tooth and his companions with loads of salt was the first time any of the southern tribe had ever been among the Cave People. Og and Ru and Tao, too, were glad, however, that they had come and brought the salt which was much needed. They were glad also to be selected as the hunters to go back with the Flat Heads and try and slay these mysterious beings of the mist that Big Tooth's people so much feared, and they rejoiced and feasted with the visitors until late in the night before they returned to their caves, kindled their protective fires before their doors and rolled into their bear skin robes against the chill of night. And next day the two hunters and Tao went about their preparations for the long journey to the Flat Head country with great enthusiasm. 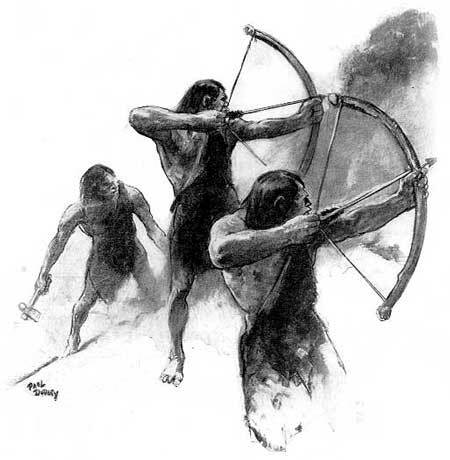 Og and Ru greased their strongest and heaviest bows with bear fat, while Tao, who was not a hunter, but who always accompanied Og and Ru as fire tender and made their arrow heads for them because he was an excellent craftsman, worked from sunrise to sunset twisting new bow strings, shaping and fletching arrows, and chipping new arrow heads. 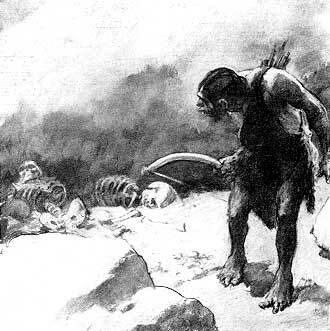 It was three days before the hunters were ready; and when they finally left the cave colony and started down the river trail, they carried nothing with them save their bows and arrows, their stone hammers slung in the thongs that girdled their waists and held their skin garments into place, and their precious flint fire stones. At least, Og and Ru were thus equipped. Tao carried a stone hammer and a flint knife but no bow, and the Flat Heads carried blunt stone hammers, their only weapons. They took no provisions, for they intended to live off the country on their trek southward. It was a long, slow journey, too, that required more than a month of steady travel, following game trails where they could, and hacking their way through the primitive wilderness where they had to. They could not travel long hours either, for they must needs make camp early and get their fires started before nightfall, for though they were armed, there were creatures abroad they did not care to encounter, such as the great sabre tooth tiger, the savage hyenas that traveled in bands, wolf packs from the north, and occasional woolly rhinoceros or blundering hairy mastodons, not to mention great snakes and other creatures against whose tremendous strength the cave man's might was puny. Og and Ru and Tao slept on the ground curled up in their skins, while Tao kept the fire constantly burning. But Big Tooth and his companions felt safer in the trees and they always took to the branches and huddled together at nightfall. Thus they journeyed until one moon waned and another was well up in the heavens before they crossed the mountains and began to drop down into the sub-tropical country of the Flat Heads. Then a few suns later, they began to descend into the great lush valley surrounded by towering mountains, in which Big Tooth's people lived. It was a beautiful bowl-shaped valley walled in on the south by an old extinct volcano. At the base of the volcano was a great pocket surrounded by cliffs, in which clouds of white vapor boiled and curled upward, like a curtain hiding what was beyond. Og had seen this valley before and he knew that the Flat Heads called it the Valley of the Mist. It was there the monsters dwelled who caused them so much fear, and it was into this valley that the old men and women of the tribe were sent to be sacrificed by Pong, the devil doctor. IT WAS not difficult for Og and Ru and Tao to see that a great change had come over the Flat Head village since they had last been there. When they entered the big banyan grove in which these tree dwellers had their colony, they were aware of dark furtive forms which crouched among the branches of the spreading trees, clinging to their rude platforms and staring down at them, half in fear and half in wonder. Indeed, had it not been for the presence of Big Tooth and his companions with them, Og felt certain that they would all have fled at their coming and disappeared into the forest. But Big Tooth allayed the fears of his people as they entered the grove by people as they entered the grove by calling loudly that he had brought back their friends, the hunters who had killed the great lizard of the salt cave, and that they were going to slay the monsters who dwelled in the Valley of the Mist. This news caused many shouts from tree to tree that soon became a babble of voices, and when Big Tooth and Og reached the cleared space that was the council grounds of the tree dwellers, some of the bolder men began to swing down out of the trees and waddle toward them, blinking curiously and watching them suspiciously. "Let us call a council," said Big Tooth to some of them, "I have much to tell you." "Let us light a council fire and gather around it as our Cave People do," suggested Og. "Perhaps a fire will give them greater courage to stay down on the ground out of the trees." This idea appealed to Big Tooth and he began to gather wood with Og and Ru and Tao, and when finally Tao kindled a big fire in the center of the council grounds and it began to crackle and send up flames and sparks and billowing blue smoke into the branches of the trees, more and more of the Flat Heads came down to the ground. There they gathered around the flames in a solemn circle, staring at the fire in wonder, and warming themselves in the glow. And when all of them had gathered, Big Tooth stood up in the circle and began talking. "I have brought back with me the mighty hunters from the Cave People who kill with flying arrows," he said. "They will go into the Valley of the Mist and slay the unknown monster who Pong, your devil doctor, says rules the sun and the stars, and who brings misery on the Flat Heads. When the monster is dead, if there really be such monsters in the valley, there no longer will be anything for us to fear, and the old men and old women will not need to be sacrificed. They can dwell among us in safety and give us their wise council as they did in the days of my father." "But Pong says that no man can kill these monsters." "Pong lies!" exclaimed Big Tooth in exasperation. "My father, Split Ear, said there were no such monsters in the Valley. But if there are any, the mighty arrows of Og and Ru will slay them and..."
Big Tooth suddenly stopped talking, while grunts and exclamations of fear came from the gathered Tree People, for into the firelight moved a grotesque and very ugly looking figure; a big man wearing a strange cape and head dress made of bird feathers. His naturally ugly face was made still more hideous by dabs of colored clay. This was Pong, the devil doctor, who ruled the Tree People. Og and Ru and Tao guessed who he was immediately. Into the circle he moved, men and women scurrying out of his way. Straight to Big Tooth he advanced until he stood before him. Then he drew himself up with great dignity and after a moment of silence spoke. "Big Tooth, son of Split Ear, talks the folly of his father. There are monsters in the Valley. We hear them rumble and grumble. We see the steam from their breath when they are angry. We know they devour the old men and old women we have sent up there to be sacrificed to them. None have ever come back." Then he turned and looked disdainfully at Og and Ru and Tao. "Who are these mighty hunters from the Cave People who think they can slay monsters that can not be killed by mortal man. Their arrows will be nothing against the dwellers of the mist. They will be broken and shattered and these puny men will be crushed and devoured. It makes me laugh to think what fools they are to try to go into the dreaded valley.". His stare and the way he belittled them both in tone and attitude made Og angry. Suddenly, the young hunter from the Cave People was on his feet facing Pong, the devil doctor. "We have hunted long and we have traveled far and never yet have we seen a monster. Never yet have we seen a single living creature that could not be killed by man. We are not afraid of these creatures who live in the Valley of the Mist. With the sunrise tomorrow, we three, Og and Ru and Tao, will go forth up into the Valley of the Mist and slay these monsters. I, Og, have spoken." "And I," added Big Tooth, "will go with them to prove to my people that there is nothing to fear and that Pong, the devil doctor, lies to them and counsels the fear of cowards." THERE was no feasting that night in the Flat Head village, for these furtive, timorous people were so afraid of the dark that they hurried to their tree refuges as soon as the sun went clown, despite the fact that the council fire still burned. From the branches of the banyans, they looked down on Og and Ru and Tao, as they crouched about the fire, and marveled at their bravery. For a long time the three hunters from the Cave People sat there, talking and speculating among themselves as to what manner of beings did dwell up there in that mist-filled valley. They wondered, too, what was the reason for the mist and why it was that all the old people who were sent up there never came back to the Flat Head village. The more they talked the more apprehensive they got until before long Og found himself wishing that he had not been so bold as to speak out to Pong and declare their intentions. It would have been better, he thought, if they had taken their time and scouted the valley to determine whether there were indeed monsters in there. But the more he thought and talked of it, the more disturbed they all got, until finally he decided the better course would be for them to roll up in their blankets and forget about everything in sleep. With the coming of daylight, the Flat Head village was astir early. As the sun came up, the people began to descend from their strange houses of sticks in the trees, which were little more than rude platforms, and gather around the fire talking and eating fruit which was their chief diet. Some of them brought fruit to Og and Ru and Tao, and presently Big Tooth, who had slipped away at daylight, returned with an armful of great nuts which he cracked with Og's stone hammer and passed to them. They were nuts the Cave People had never tasted before, sweet and luscious and all three enjoyed them tremendously. While they were eating, Pong, the devil doctor, looking more ugly than ever, came down from his tree and strutted toward them, smiling unpleasantly. "The mighty hunters of the Cave People are not hurrying up to the Valley of the Mist. It seems they would rather eat nuts than face the monsters. Perhaps they have changed their minds since last night and are not going," he said in a manner that for some reason made Og very angry. "We go now," replied Og abruptly, as he finished the last morsel of his breakfast. "Come, Ru and you, Tao. We start. Big Tooth, do you go with us?" "Yes, Big Tooth is going too," replied the young Flat Head sturdily. "Here, then, take my stone hatchet so that you may split the skull of any monster who might attack you. My bow and arrow will be enough for me." Og gathered up his bow as he spoke and Ru followed his example, while Tao took his stone hatchet from his belt. A moment later, with the two bowmen together in the lead and Tao and Big Tooth following, they left the village and started up the slope toward the valley at the foot of the volcano, there to face whatever danger might confront them in the mist. It was a long climb toward the valley at the foot of the extinct volcano and some of the Flat Heads followed them a little way on the ground, while others swung along through the trees. But as the forest began to give way to the more open slope of the mountain, they, too, remained behind and watched with mingled fear and admiration the four adventurers as they went on alone. As for Og and his followers, with their approach toward the mist-draped entrance of the valley, they instinctively moved a little more slowly, while they peered ahead and listened to the strange noises that now became audible emanating from the mist. Weird mutterings and grumbling sounds came down to them, accompanied by strange hissing noises and sounds that resembled human sobs and groans. And as they approached the opening in the cliffs that walled in the valley, these awesome sounds grew louder and more menacing, until all four were nervous and apprehensive. Tao and Big Tooth were obviously the most frightened of the quartet, but Og and Ru, their bows strung and arrows ready, were but a little less disturbed, and they peered ahead toward the mist with eyes large with fear. "This is an ugly place," said Tao thickly. "My heart is pounding. I try to be brave but I am frightened. What makes this steam and those awesome sounds?" "It is the monsters. They are in there. Never will we come back alive," replied Big Tooth, his teeth chattering in fear. "Have courage," counseled Og with husky voice. "We must go on. We must go into that mist and find these monsters. We said we would do this thing and we can not break our word even if death confronts us. We must be brave and..."
SUDDENLY Og ceased talking and stopped in his track. At the same time, Tao and Big Tooth and Ru crowded together and stared, for they had all caught sight of the same thing through the steam. "Bones! Human bones! There is a skeleton leaning against that rock!" cried Tao, in alarm. "There is another sitting against the cliff, and there are more bones scattered about the ground. This is the work of the monsters," cried Big Tooth. Og moved cautiously toward the gruesome objects scattered toward the entrance of the valley. Then suddenly he made a guttural grunt of disgust. "No, this is not the work of monsters. These are the skeletons of the poor Flat Heads, the old men and the old women who have been sent up here as sacrifices. They have huddled here at the entrance of the valley. They had not the courage to go through the steam, and they dared not go back to the people, so here they stopped to die of fright or hunger. Look, not a bone is gnawed. This is not the work of any monster or animal either. These old people let fear kill them, and if we do not have courage our fears will get the better of us, too. Come. We are going into the steam, into the valley to find out what all these noises are." Og suddenly, determinedly mustered up his own courage and moved on ahead into the steam and the others, taking heart, followed. Deeper into the blanket of mist that swirled around them, they penetrated, Og and Ru with bows ready and Tao and Big Tooth clutching their stone hatchets. Thicker grew the steam, and louder and closer at hand grew the strange noises, the sobbing and the groaning, the muttering and the grumbling sounding so awesome that Tao and Big Tooth could not still their trembling. They moved on more slowly now and closer together, the better to see each other in the steam and for the comfort that contact with each other gave them, for none were yet convinced that there were not monsters in this land of swirling vapor, and only their will power dominating their fear drove them onward. Suddenly, as they moved forward, they became aware of a big form looming up in the mist ahead of them. Tao was the first to see it and a loud cry of fear escaped him. "Look! Look! There is something ahead, something big and dreadful!" "I saw it! It has horns! It is a monster!" cried Big Tooth. "There it is again!" screamed Tao. "Shoot, Og! Shoot! Loose an arrow! It is a monster! It comes toward us! It..."
The sharp strumming twang of two bow strings cut short Tao's cry, for through a rift in the steam, Og and Ru had glimpsed the big form, and simultaneously they had loosed two powerful hunting arrows. The instant the bow strings strummed, a loud trumpeting bellow sounded from out of the steam, accompanied by a violent thrashing sound, and then a sudden and very loud splash. Quiet followed, broken only by the strange muttering rumble of the steam. "Behold! Here is your monster! Dead! Come, he can not hurt you! He is nothing but a bull elk. We will have a feast for he is already cooking for us." Not comprehending what Og was telling them, the three others started forward through the steam, presently to discover Og standing on the brink of a great pool of spring water, It was boiling hot water that was bubbling up in a basin of rock and making strange grumbling noises while jets of steam escaped from the cracks and fissures in the rocks on either side and produced peculiar sighing and groaning sounds. In the pool lay sprawled the carcass of a great pre-historic elk with two arrows buried deep in its hairy chest. "Look, you!" exclaimed Og. "It is just a hot spring. That is the monster that makes the mist and all the grumbling noises. It is nothing to fear. I have seen hot springs before on the sides of old volcanoes. And the monstrous form we saw in the mist was just a big elk who had got lost and was trying to find his way out. Our arrows laid him low and now he is cooking for us in the hot water. Smell the odor of cooked food. It makes me hungry." Ru and Tao began to grin and nod, but Big Tooth could only stare in wonder because he had not traveled as far as the Cave People and he had never seen a hot spring. "Let us drag the old elk out and have a feast of boiled meat," suggested Og. "I know. We will protect our feet. We will cover them with our bear-skin blankets. Look! I will show you." Tao, with his flint knife, hacked a big section of hide from the skirt of his bear-skin garment and bound it about his feet in the form of a fairly creditable moccasin or shoe. And when the others saw what he was doing, they followed his example, all but Big Tooth, who wore no bear skin, but only a loin cloth of jackal hide. Og and Tao gave him sections of their bear skin, however, and presently he was equipped with shoes. They then returned through the steam to the edge of the hot spring, and seizing the protruding antlers of the great elk, dragged it out of the bubbling pool to a place among the rocks well out of the steam. There they crouched around the carcass and began to tear off strips of the now very tender meat, for the hot water of the boiling spring had cooked the elk to a savory niceness. And as they crouched there, tearing the meat apart with teeth and fingers and making loud smacking sounds of pleasure, a change in the wind began to blow the steam in another direction and presently, through a rift in the misty curtain, the four adventurers saw the sweep of a lush green valley with towering cliffs on one side, pitted with caves, and beyond a great expanse of the blue water that was the ocean. "I will lead them up here. I will show them there is nothing to fear except the lies that Pong, the devil doctor tells them."